How Much Alcohol's In That Drink? Don't want to overindulge in the holiday spirits? Then watch what kind of glass your bartender reaches for. A study published Friday in the BMJ, formerly the British Medical Journal, confirms that even experienced bartenders tend to unwittingly pour more alcohol into short, wide glasses compared to tall, skinny ones. That means two cocktails from a squat tumbler might actually pack the punch of 2½ drinks. So instead of that martini glass, those watching their drinks might want to ask for a highball glass instead. "People say, 'Oh, the bartender knows what he's doing.' Well, the bartender does know what he's doing in a lot of cases, but he falls victim to these illusions," said lead author Brian Wansink, a Cornell University marketing professor. Wansink wanted to find out if training could correct the so-called portion distortion illusion that causes people to misjudge volume based on container shapes. Researchers recruited 198 students at the University of Illinois at Urbana-Champaign to pour 1½-ounce shots from a bottle into one of two types of glasses: tall and skinny or short and wide. Students poured 30 percent more into the stubby glasses than the tall glasses. Some students even made the misjudgment after 10 practice pours. Experienced bartenders fared slightly better. 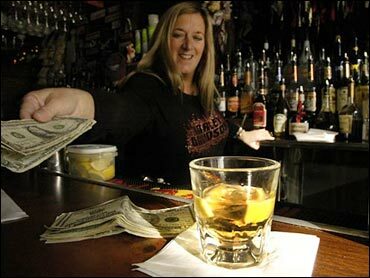 Eighty-six bartenders in Philadelphia asked to pour shots on the job put 20 percent more into the short glasses. Those asked to pay careful attention to the task were slightly more on target. Wansink concluded that practice, concentration or experience only slightly reduce the pour-more-in-short-glass effect. That extra splash of alcohol can add up. Drinking 25 percent more alcohol per drink could skew calculations of bar patrons and partygoers trying to stick to one cocktail an hour. Wansink suggested measuring shots - or using tall glasses. Baylor College of Medicine obesity researcher John Foreyt, who was not involved in the study, said he was surprised that even experienced bartenders fell prey to portion distortion. He said the study underscored the need for people to be careful not to underestimate their intake.